Compared to last year's ranking, Korean Yu Jin Seong is the only newcomer in the Top-5 this year, getting place #4 despite a tie in his Best-5 with his team mate Lee Choong Goon (Best-5s: 1414), whose weaker competition attendance cost him one place (9 vs. 12). Yu Jin Seong finished 2012 at the #7 place and made the most of German Martin Sloboda's (former #6) fall to step into the breach. After having spent half a year knocking on the Top-5 door, he finally entered, browsed (one month of #5, two of #4, one of #2) to finally settle down as the World #4 in December, contemplating the world from heights he hadn't reached since 2008. Yu Jin Seong is not much of a Battle guy. Classic is his thing: winner of the Slalom Opens of Shanghai and Lishui this year, he got the silver medal at the World Championships behind his team mate Lee Choong Goon… despite a broken arm! By the way, they also won the Pair Classic at Namwon together. C.S. You have improved your ranking a lot this season (Dec.12: #7 > Dec.13: #4) and you entered the Top-5! Do you think you can enter the Top-3 next year? YJS. When I was younger, I was just trying to do my best in slalom, and in 2008 I was #5 at the World Ranking. My dream was to enter the Top-3. But in 2010 I had a big exam for the University so that it was difficult for me to improve my ranking and it was just not the main focus of the time. I reached place #5 again in August 2013 and even got the #2 place last November. I fulfilled my dream. I had what I hoped for, I feel complete. I don't care about the ranking anymore now and I will just try to do my best for 2014. 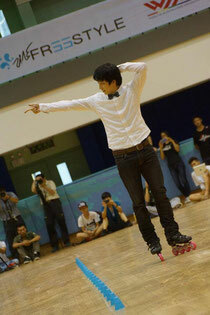 And there are so many strong skaters that it's very difficult! "I tried to choreograph my whole slalom history"
C.S. What was your best competition performance in 2013? YJS. My best performance of the season is at the WFSC because I tried to choreograph my whole slalom history, which is 11 years long, in my Classic run. I had brought old skates at the competition, from the first slalom skates I bought until now. I wanted to show more of me to the other skaters. I was not really looking for a good competition ranking, my aim was to show something sincere about me, about how I love freestyle slalom. I know that in a couple of years I will have to stop competing to go to the army and then for work, so I wanted to show that. C.S. Do you have regrets? YJS. Yes I do have regrets about my Pair Slalom and Speed Slalom at the WFSC. When I was preparing for Lishui and the WFSC, I had an accident and my arm dislocated. I was practicing our pair program with Do Ji Hwan and I failed on a landing. I went to the hospital and the doctor said that I shouldn't move my arm for three weeks! So my preparation for the WFSC only consisted in watching and checking DJH practicing. I tried the program only a few days before going to Lishui (note: a week before the WFSC). But I still couldn't put big amplitude in my moves, which was needed for my hard tricks. So I gave up on battle and speed slalom. But it will be better next time! C.S. What did you improve in your skating in 2013? YJS. I tried several new styles in 2013… Whenever I have an idea, for example jazzy or hip-hop styles, I want to try them together with music. And I tried that concept in my Classic, showing to people what I want about my style, enjoying it and not caring about the result. C.S. What are your goals for 2014? YJS. I want to meet with my good skater friends as much as possible, and run many workshops so that I can help people, teach my tricks, share my know-how… and see them improve! so that I can help people"
C.S. What do you think of the rule updates for Classic Slalom? YJS. Good! I think 2 min in Classic is a good thing. Before there was 1 min 30 but what was happening before the first cone was not taken into consideration. But I guess we all think different. I think it's fair to evolve the timing to 2 min, but I know that there is no perfect rule either. But it's positive to try and try to see what works best. This is how slalom can develop. I think that if we really want to develop our sport (with rules, and more), we should mix our movement principles with scientific research, and combine them with rules, and then the world will recognize freestyle skating as a sport. Doing research and development on movement principles (kinetics) would be interesting. Kim Tae Bin studied kinetics at the sports university and combined it with slalom. He wrote a paper about his kinetics researches on slalom and graduated. I think this is a good try to develop slalom as a recognized sport and we should consider doing more things like that. C.S. The last two seasons (2012 and 2013) you took part in a dozen competitions each year. What are your plans for 2014? YJS. I don't know, it depends on the time and opportunities I will have to join competitions or not. Same for 2015, if I can I will try my best to be everywhere!